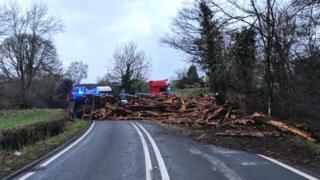 A lorry carrying timber overturned and spilled its load, closing a major road. The A470 was closed between Llandinam and Llanidloes in Powys following the spill at about 06:20 GMT. Nobody was hurt, although a large amount of timber was spread across the road and verge, and work to turn the lorry upright continued until 13:20. An environmental unit was called in to help with oil and fuel spillage and Mid and West Wales Fire and Rescue Service attended along with Dyfed-Powys Police.